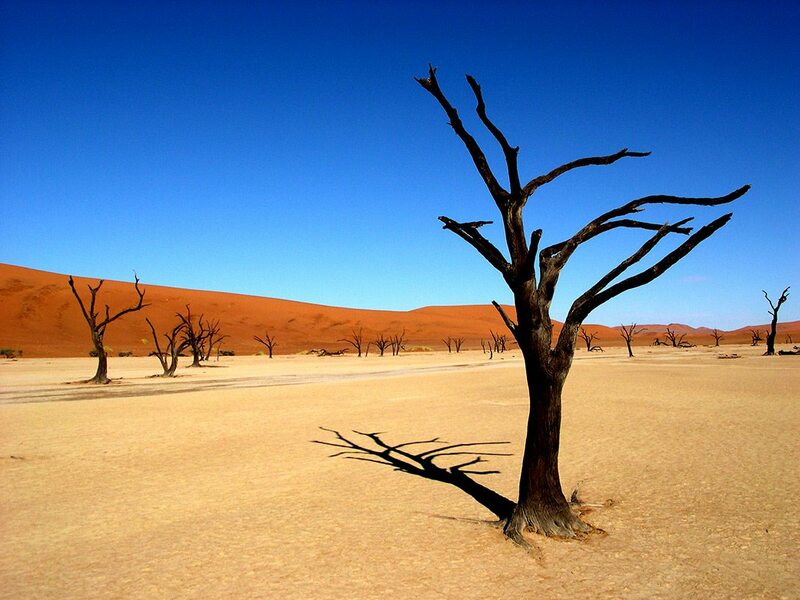 The highlight of any luxury Namibian safari is visiting the magnificent areas of Sossusvlei and Deadvlei in the heart of the Namib Desert. 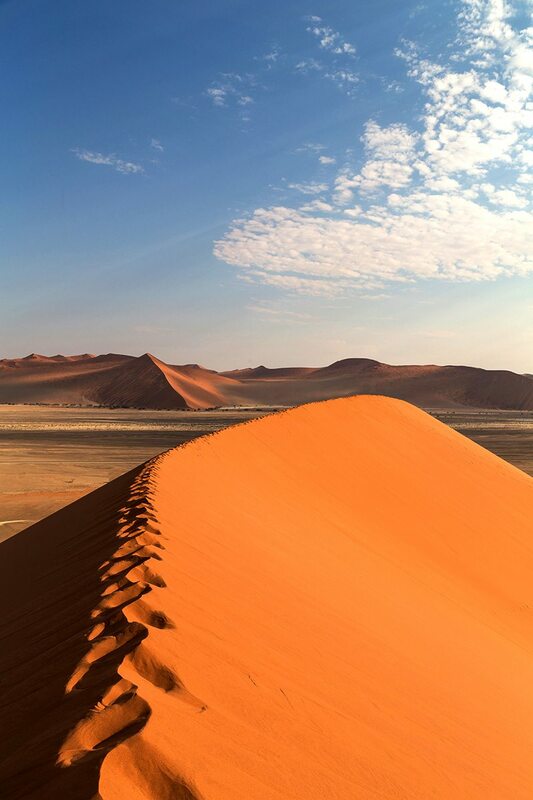 Rise at dawn and drive into this waterless wonderland, hike up Dune 45 and visit salty pans surrounded by ochre dunes of gargantuan proportions. 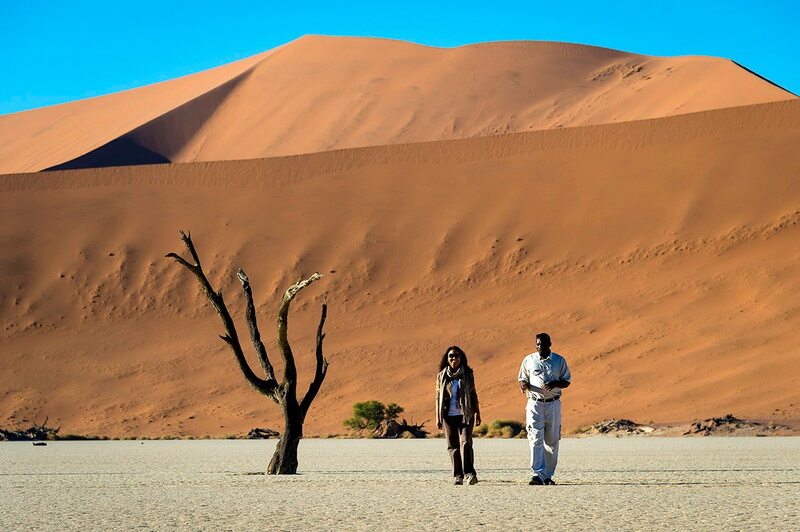 It was a very early start at our luxury lodge for a magical excursion to see the Sossusvlei sand dunes. We travelled in an open 4×4 through the cool, dawning desert. Driving us was an excellent guide, Roger, who shared his knowledge of the area, animals and plant life as we went. We entered the Namib-Naukluft National Park just as the dawn was reaching a rosy perfection and while the temperature was still mild. The dunes on either side were apricot coloured and utterly mesmerising. 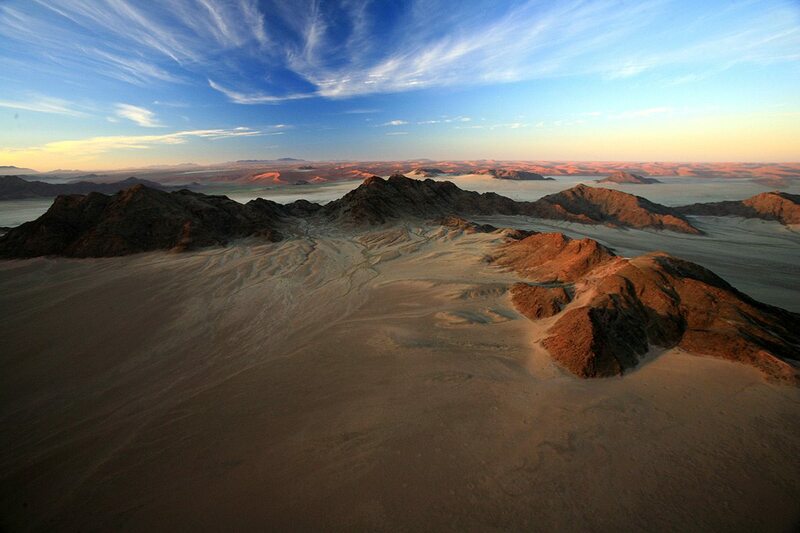 After a while, we stopped close to Dune 45 – so named because it’s situated 45 kilometres from the Sesriem entrance gate. It’s the most famous dune in the park. We got out to admire this almost 200m-tall monster. Then we began our hike. 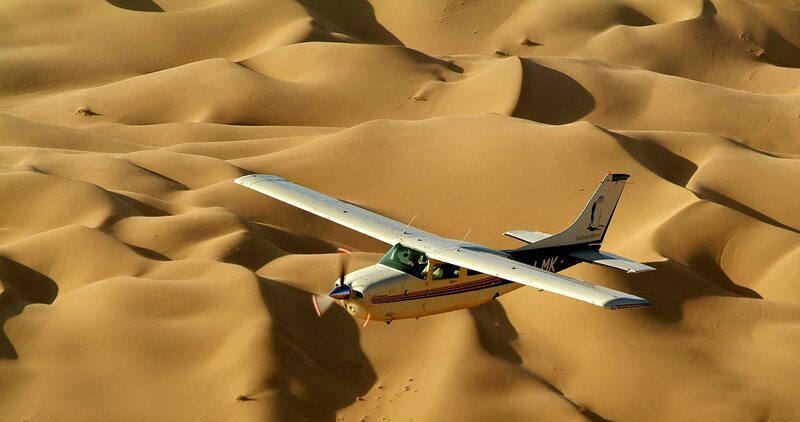 Dune 45 is made of fine, loose sand, and the going was tough. My partner and I had taken off our shoes and were climbing in our socks. Roger had recommended this technique, as the cloth of the socks creates a kind of webbing between your toes and helps with traction. This way, your shoes don’t fill with sand and weigh you down. ‘Dunes are often thought of as being barren and lifeless,’ said Roger as we climbed. 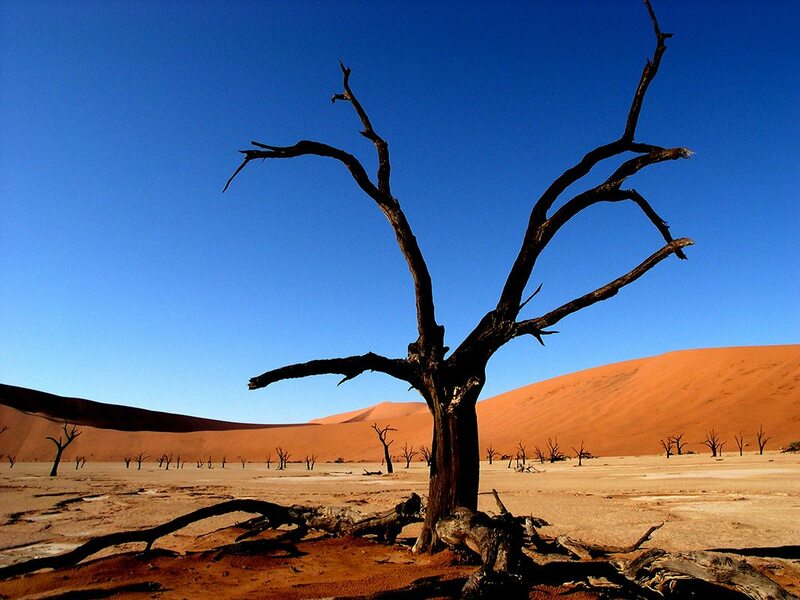 ‘While this is the case in many deserts, the Namib is sufficiently old for endemic species to have evolved. The dunes are wonderful little ecosystems unto themselves! 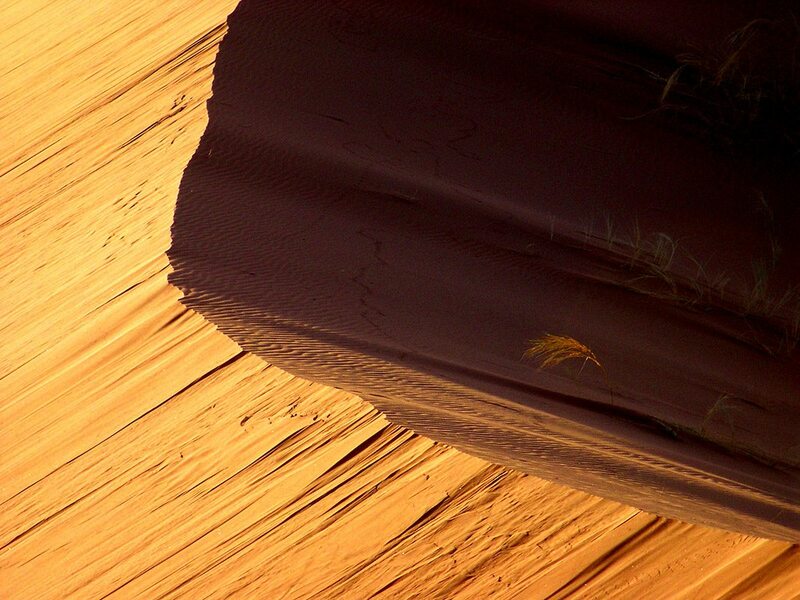 The sun had just begun to peep over the horizon, bathing the dune in orange light. Within minutes, the temperature began to soar and we needed to stop every now and then for water. Dune 45 lures you into a false sense of accomplishment early in the climb. You think that the next crest is the top. Once you get to the ridge, you see another, even larger crest. Then another. It must be said that the views from the summit were spectacular … and the return journey much easier. We walked back on the shady side of the dune, as the sunny side was hotting up rather nicely! 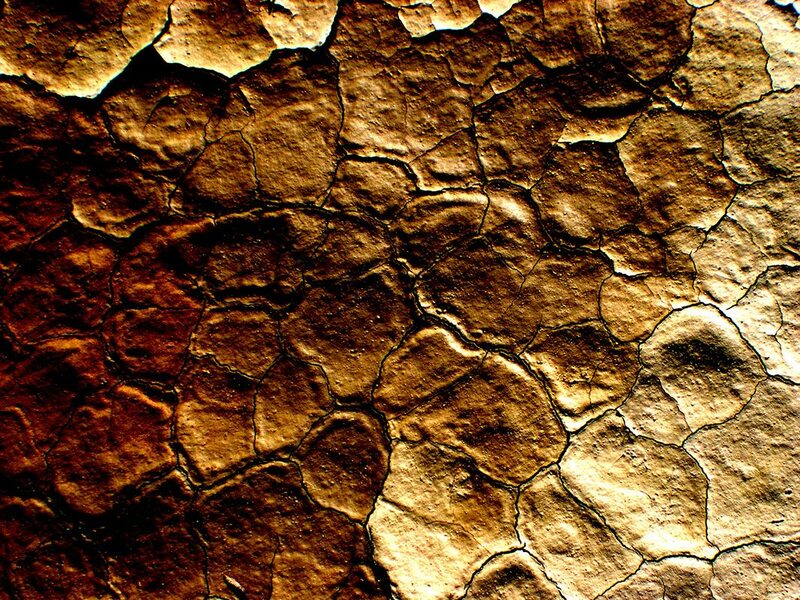 After a while, we drew to a halt again and continued on foot into a ravishing landscape of ochre dunes. 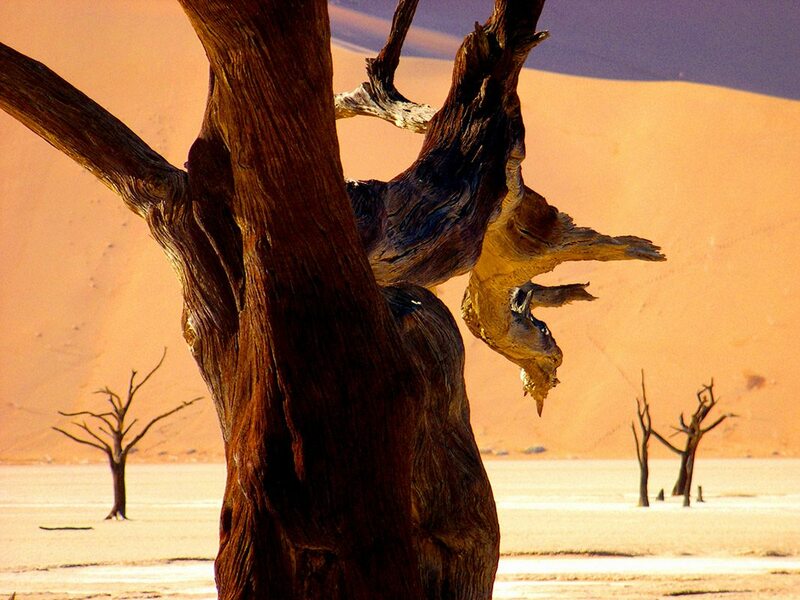 Coming over a rise, we reached Deadvlei, a clay pan dotted with the skeletons of trees, some of them more than 500 years old. 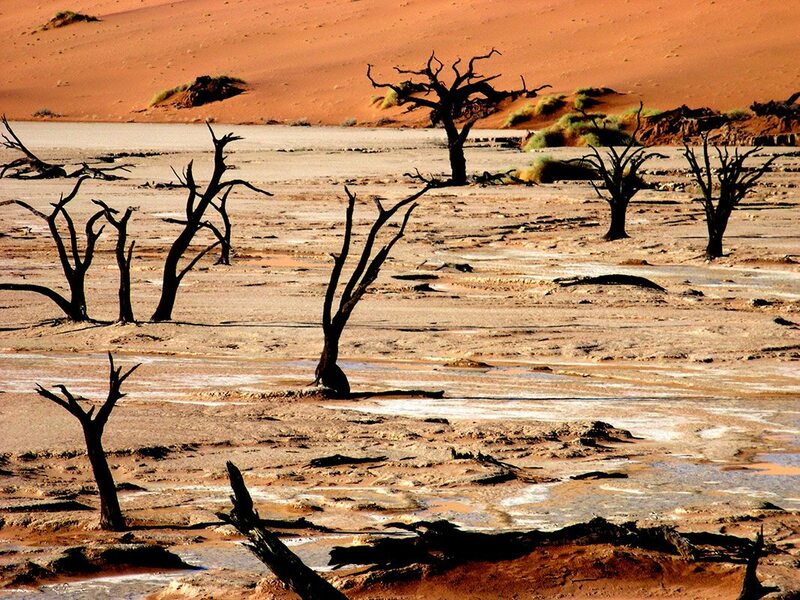 Deadvlei used to be an oasis that supported camelthorn trees, but the river that watered the oasis changed its course and the trees eventually died. 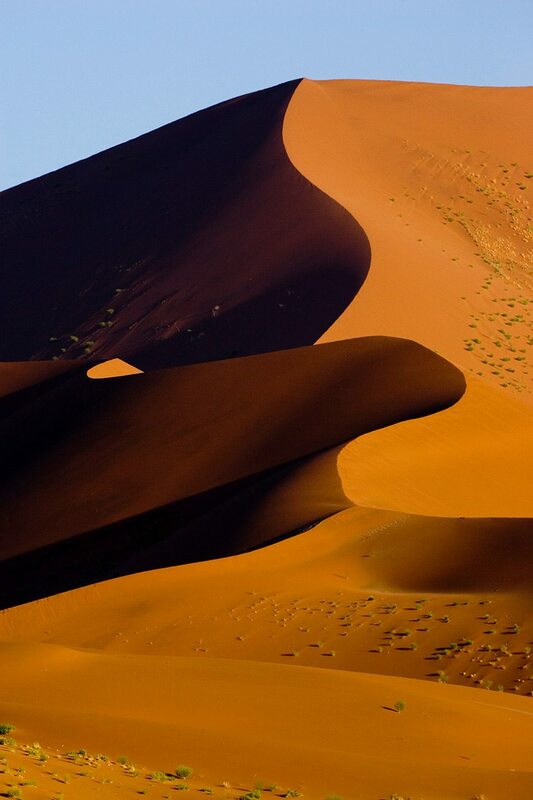 Orange dunes, white pan, black trees, navy-blue sky: it was almost like a Salvador Dali painting come to life. 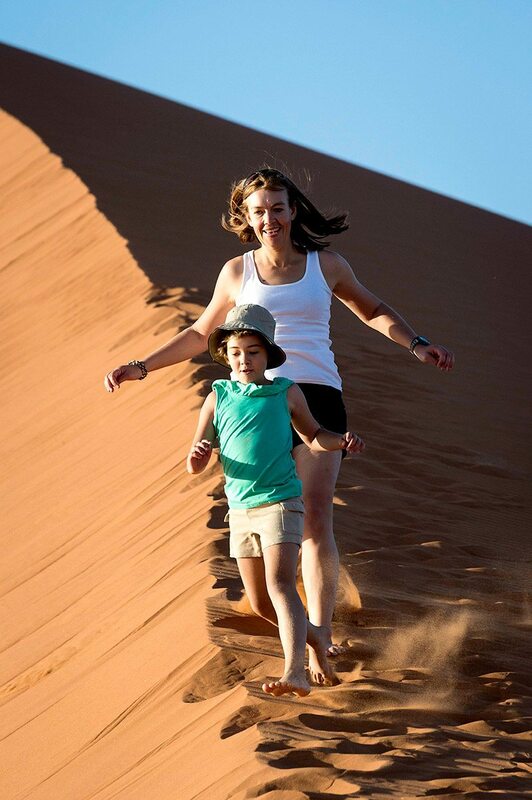 The more energetic in our group climbed to the summit of Big Daddy Dune, one of the highest in the Namib. But I was more interested in taking photos of the weird trees. 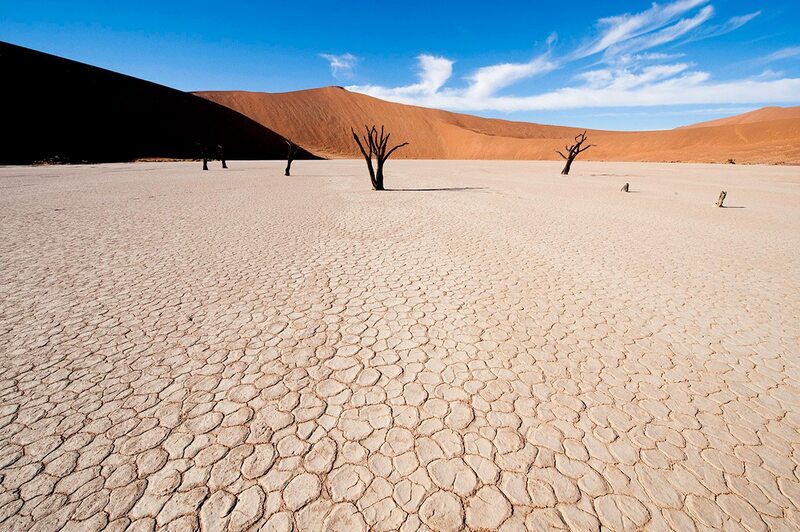 Once we’d finished exploring and photographing Deadvlei, we walked north to beautiful Sossusvlei. This is also a clay pan, elliptical in shape, covered in a crust of salty sand. ‘While the vlei has been shaped over time by the Tsauchab River, the actual flooding of the pan is a rare event,’ explained Roger. ‘Sometimes many years pass between one flood and the next. The river is dry most of the year, and even when it’s not, it carries relatively little water into the vlei. For now, it was bone dry. 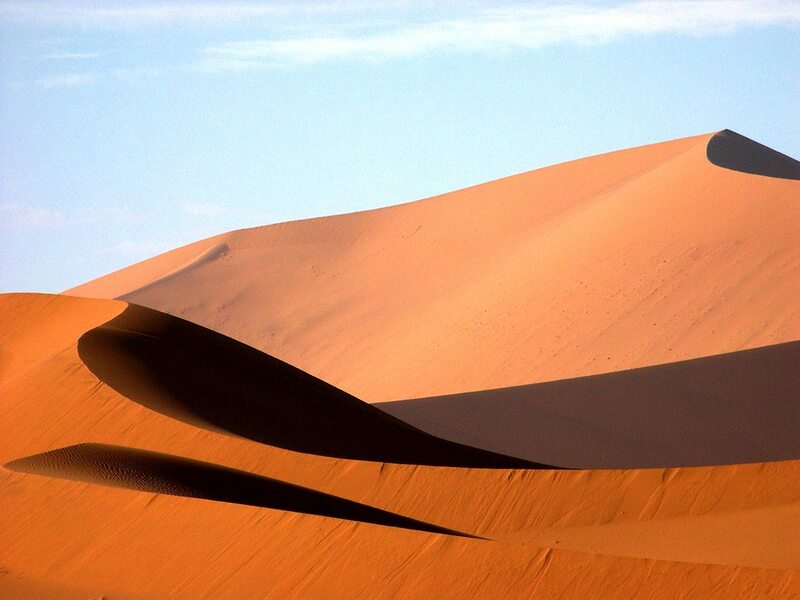 The dunes surrounding the pan were sublime. Roger told us that their pink-to-orange colour was an indication of high concentration of iron in the sand. 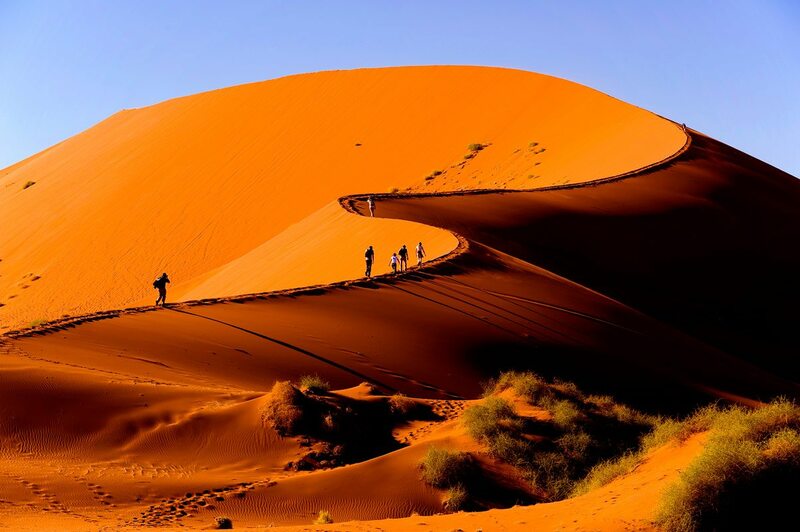 The oldest dunes were those with an intense, red colour. Some of these giants were almost scarlet. Just then, an oryx trotted along the crest of a rise like a painted warrior. It stopped and turned to look at us, rapier horns etched against the sky, then cantered off. 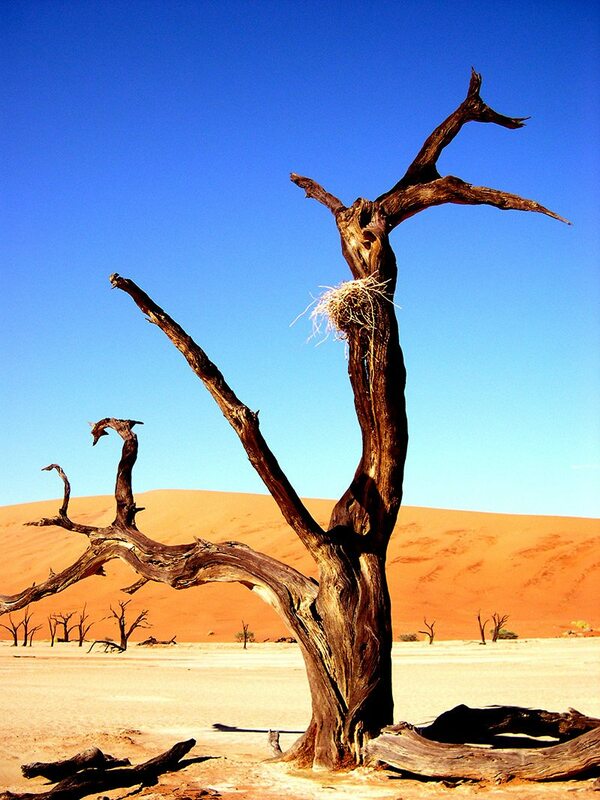 What a perfect annunciation to end our Sossusvlei adventure. 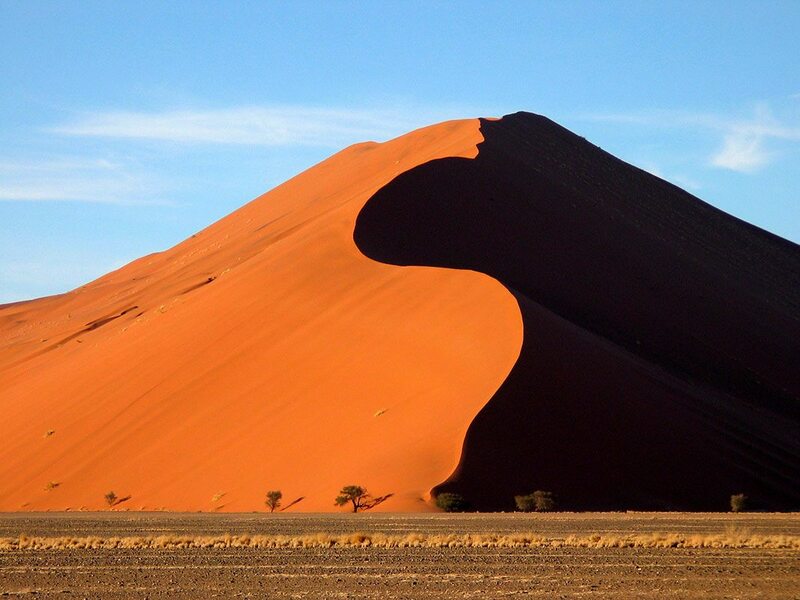 Hiking up the Sossusvlei dunes is harder than you think. 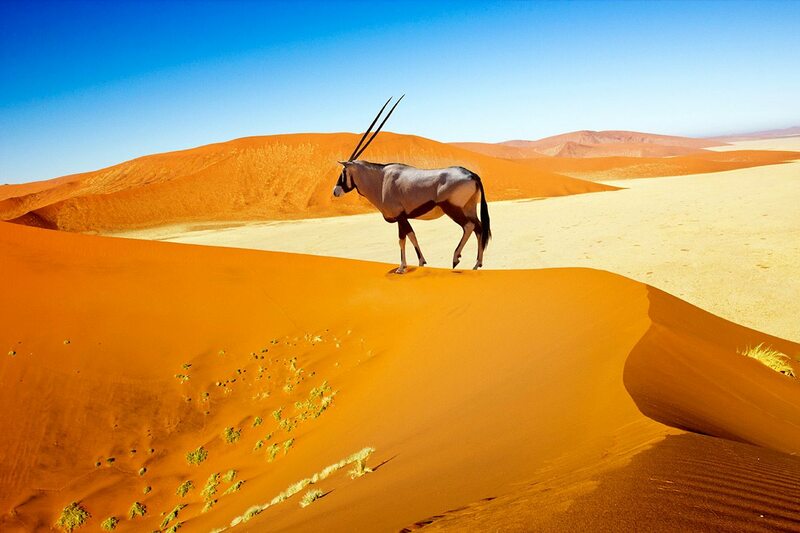 Seeing an oryx walking along a red dune at Sossusvlei is an iconic sight. 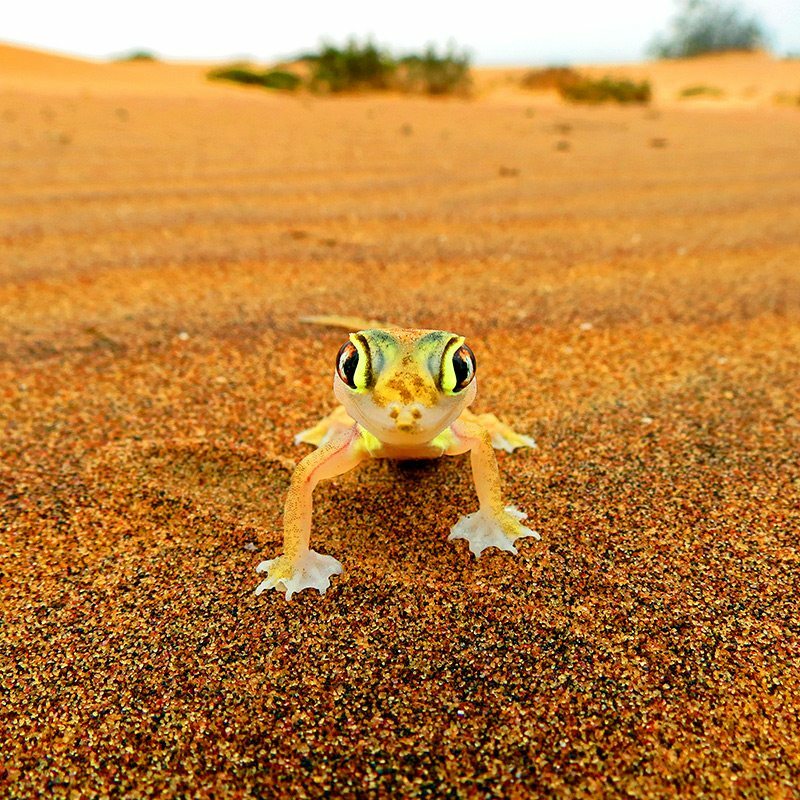 Sossusvlei is full of life, like this web-footed gecko. A hike up the famous Dune 45 is harder than it looks. 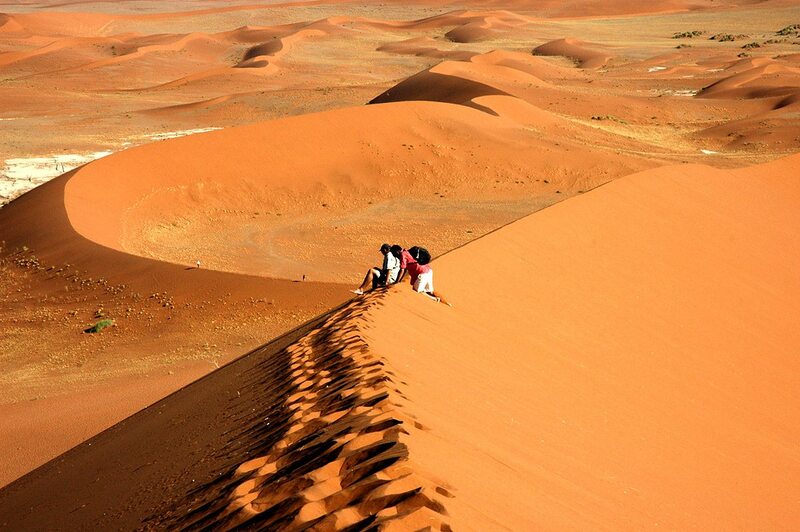 Fitter folk can attempt climbing the enormous Dune 45.